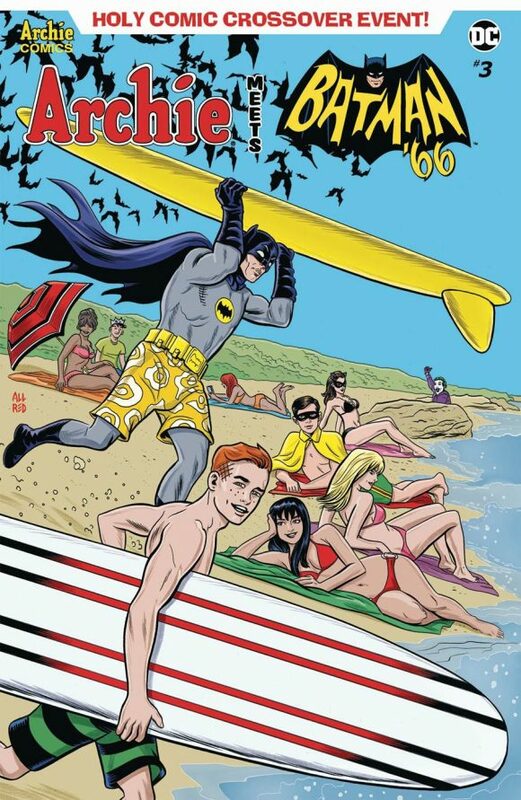 Now, Batman ’66 has been off the air for more than 50 years now but the adventures continue in the latest comic-book crossover, Archie Meets Batman ’66. The next issue is out 9/26 and you can click here for a SNEAK PEEK. The six-issue miniseries is written by Jeff Parker — who’s scripted most of the Batman ’66 comics — and Michael Moreci. Main cover by Mike and Laura Allred. “Adam was the right hero for the right time. If you consider the news of 1966, the strife in the U.S., you’d expect no welcome for a character who believes so wholeheartedly in justice and human potential for change, even in what was ostensibly a children’s show. But West brought that very particular sense of humor and sincerity that hit the exact right tone to be the foundation for an extremely cool moment in pop culture. His voice was hypnotic, and he knew how to share a scene. He wasn’t merely doing camp, that’s why others couldn’t replicate it. He was allowing you to relax and enjoy over-the-top adventure with him. — ADAM WEST: An Appreciation, by MIKE ALLRED. Click here. Kudos to “Archie Meets Batman ’66″‘s writers for honoring Adam West!